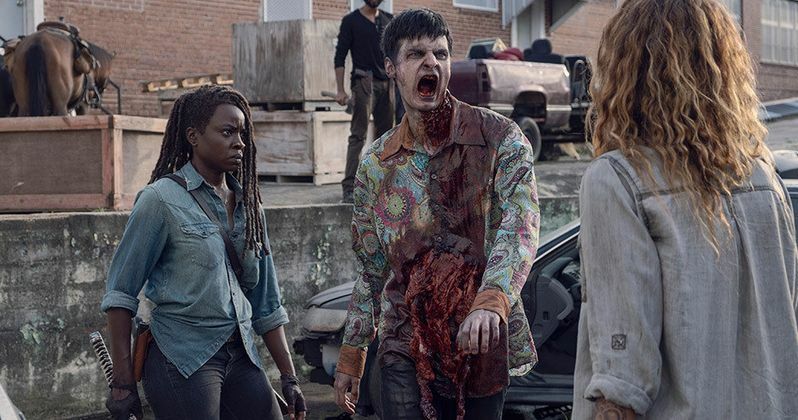 The Walking Dead season nine storyline kicks into high gear with Stradivarius. We get our first glimpse of the Hilltop. Jesus (Tom Payne) is now in charge. Maggie's absence is explained. A conflict with Michonne (Danai Gurira) is alluded. Lauren Cohan left the show to film a pilot for ABC. It's unresolved whether she will return. Rosita (Christian Serratos) barely escapes the mysterious walkers. Carol (Melissa McBride) reconnects with Daryl (Norman Reedus). Rosita is running through the woods injured. She hears whispering through the trees. Eugene is nowhere in sight. She collapses after drinking her last drops of water. Carol and Henry (Matt Lintz) have arrived at Daryl's campsite. He kills a snake in a tree, then collects a rabbit in a trap for dinner. His dog brings him a piece of a walker's foot. Carol wants him to come with her to the Hilltop. She's worried that Henry is too much of an "idealist". Daryl replies that he'll learn like they did. Michonne and Siddiq (Avi Nash) are escorting Magna's group to the Hilltop. Magna (Nadia Hilker) wants her knives back. Siddiq tells Michonne he knows she likes them. We cut to an overhead shot of the bustling Hilltop. The farms have expanded. Tara (Alanna Masterson) walks around collecting papers from various people. She heads inside to brief Jesus, who's listening to records. He's reading a letter from Maggie. She's with Georgie and has apparently been gone for some time. Jesus is uninterested in reviewing the community business. Tara congratulates him for winning re-election. He dryly responds that no one else ran against him. Michonne takes Nadia's group to their supplies. Everything has been overrun by a herd. Luke (Dan Fogler) is looking for his musical instruments. Siddiq hides a flute. Yumiko (Eleanor Matsuura) finds a bag with their weapons, but Michonne refuses to distribute them. She will not allow armed strangers into the Hilltop. She also tells them she will not go all the way. Jesus in on horseback in the woods. He's suddenly attacked by Aaron (Ross Marquand). They spar, until Jesus gets the upper hand. Aaron thanks him for the training, but feels guilty sneaking out of Alexandria. They see a flare in the sky. They race towards it and find a barely conscious Rosita. She left Eugene hidden in a barn. They decide to take her to the Hilltop, and mount a rescue for Eugene in the morning. Daryl cooks dinner for Henry and Carol. He has never found Rick's body. Carol tells him he has to put that behind him. She gives Daryl a haircut. That night, Henry sneaks out of the tent to follow Daryl. His dog has gotten stuck in a trap, and is surrounded by walkers. Daryl kills most of them, but Henry jumps in to help. Carol, bow in hand, watches quietly but doesn't intervene. Michonne and the others have settled in a building overnight. On watch, she hears a noise and confronts Luke. Fearing a weapon, she slices through a priceless Stradivarius violin he was holding. Despondent, Luke tells them that art and music are the key to civilization. The next morning, a herd approaches. Michonne allows them to use their weapons. Nadia sees a former member of their group has turned into a walker. Michonne gently dispatches him. At the Hilltop, Tara updates Jesus on Rosita's condition. She will search for Eugene. The people need Jesus to lead. On the road, Siddiq reveals to Michonne that Maggie is not at the Hilltop. She left with Georgie. Michonne is stunned, something bad transpired between them. Siddiq reminds Michonne of her promise to Carl. Riders approach from the Hilltop. They tell them that Rosita is there. Michonne decides to accompany the others. Connie (Lauren Ridloff) sees something watching them in the woods. Daryl arrives at the Hilltop on his motorcycle. Carol and Henry are right behind him. Jesus and Tara explain what happened to Rosita. Daryl decides to lead the search for Eugene. Aaron and Jesus, who promises to be a better leader when he returns, leave with Daryl. "Stradivarius" sufficiently explained Maggie's disappearance. Daryl had a scar on his back in the same place as Michonne. I wonder if this has anything to do with Michonne and Maggie's hinted conflict. Nadia's group reaching the Hilltop is sure to spell doom for someone. I have no doubt next week will see major casualties. Tune in as AMC brings the Whisperers in focus for the midseason finale.